Toronto remains North America’s fastest-growing technology market, while Ottawa has the largest concentration of tech talent, according to CBRE’s annual “Scoring Tech Talent” report. 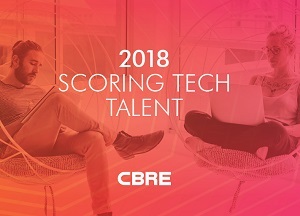 CBRE’s North American 2018 Scoring Tech Talent Report. “Relative to the U.S., Canada is a cost-effective place for technology companies to operate,” said CBRE Canada executive managing director Paul Morassutti, who noted the low value of the Canadian dollar compared to its American counterpart is the major factor in its affordability. Governments, academic institutions and businesses have aligned and invested to make Canada a technological power on the world stage. Incubator spaces like the MaRS Discovery District in Toronto, for example, serve as catalysts for growth. Four Canadian cities and 46 American markets were included in the report, which ranks the ability of cities to attract and grow tech talent. Toronto jumped two spots this year to fourth place, while Ottawa ranks 13th, Montreal 14th and Vancouver 25th. The rankings are based on 13 unique metrics, including tech talent supply, growth, concentration, cost, completed tech degrees, industry outlook for tech job growth, and market outlook for both office and apartment rent cost growth. Toronto ranks as North America’s fourth-largest tech talent market, with 241,400 tech workers; an increase of 51.5 per cent during the past five years. Toronto added 26,900 tech jobs in 2017, which was the most of any North American city. Toronto is also the third most concentrated tech market, as 8.9 per cent of workers are employed in the sector. Toronto-area universities had 27,075 tech degree graduates from 2011 to 2016 and the city added 82,100 tech jobs from 2012 to 2017, giving it a “brain gain” of 55,025, which was also the most of any North American city. Tech industry growth has accelerated demand for downtown Toronto office space, pushing vacancy down to 2.9 per cent in the second quarter of this year, the lowest on record for the city, and the lowest in North America. Morassutti said 38 per cent of office tenants in Toronto are tech-related. Ottawa has also experienced a surge in tech job growth and has the largest concentration of tech talent on the list at 11.2 per cent, more than three times the U.S.’ national average of 3.5 per cent. This is especially important since the federal government is looking at shrinking its real estate footprint in Ottawa by 20 per cent to accommodate new working trends. “The tech demand has really filled in that gap quite nicely,” said Morassutti. “Right across the board, we’re seeing a huge increase in the percentage of tenants that are truly tech-related over five years ago, when the percentage was considerably lower. The government employs 167,000 people and the tech sector employs 70,600 in Ottawa. The tech industry has been resilient in the face of the fall of Nortel, which occupied millions of square feet in the city and employed approximately 10,000 at its Carling campus alone before the company’s collapse in the early 2000s. While Shopify is now seen as the leader in Ottawa’s tech sector, the local industry has become more diversified and includes many smaller companies, which points toward sustainable, long-term growth. There are some other notable tech markets in Canada. Montreal has 127,300 tech jobs, which is a growth of 21.2 per cent from 2012. Of the city’s total workforce, 6.8 per cent are employed in the tech sector and it’s acknowledged as a world leader in artificial intelligence research. Vancouver has 68,500 tech jobs, up 30.7 per cent from 2012, and 5.9 per cent of the city’s workers are employed in the tech sector. Avigilon, Hootsuite, Microsoft and Sony have large presences in the city, and Amazon recently announced it will create 3,000 more jobs and expand into a 416,000-square-foot downtown building being built at a former Canada Post plant. While Kitchener-Waterloo wasn’t included in the report, Morassutti said it probably merited it.